Today, I was on the Red Bubble site, an eclectic site designed to help and support artists, and noticed an article on what type of artwork sells nowadays. According to this article, a survey of 2,000 art buyers from ages 18-65 (guess 66 year olds don’t buy art??) showed that landscapes as the leading favorite in art purchases with photography coming in second. 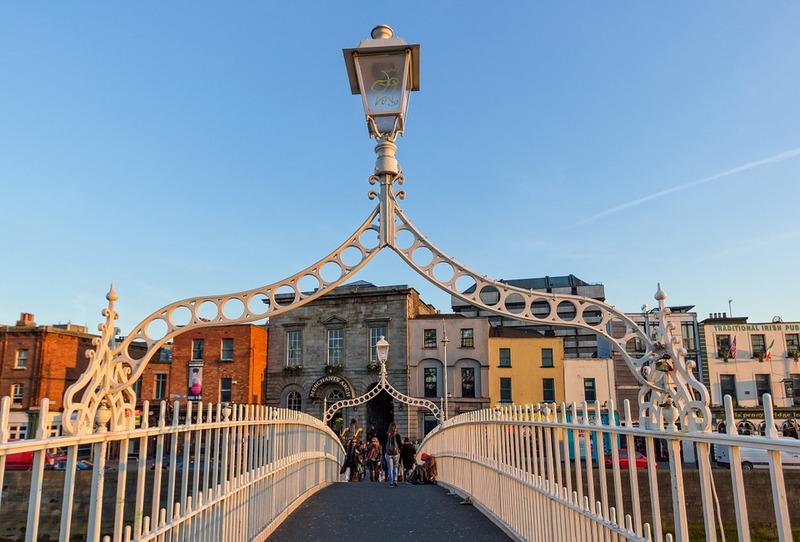 The younger group aged 35 and less, bought more photography, abstracts and pop art, while the older 45 plus, tended toward more landscapes, flowers and gardens. This makes total sense to me. I remember when I was younger, I was more inclined to go for the simple abstracts or pop art as they were less expensive. While I’ve aged (very gracefully and willingly I might add), I’ve gravitated toward the more complex in art, which usually requires a lot more cash output. I also have to agree with my brother (a science guy), who says, “If I can paint it, I don’t want it.” But most of all, I want a story, a compelling reason to take a painting off a wall and take it to the cashier. I need inspiration. 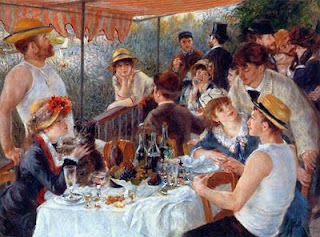 Take for instance, the painting above by Renoir--another one of my favorites. It's not a landscape so to be speak, but a painting that speaks of friendship, good times and a lust for life. This inspires me to come in and visit for a while. 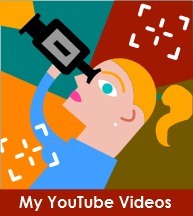 What follows is the list of today’s most popular art. For me, I think Impressionism would top my list, with a penchant toward Parisian Café life (as you can see from the above painting). But then again, I’m part of that old geezer group. What would your list look like? Back in the year 2000, my son Alex and I were walking through the National Gallery in London. We had already been stunned by the painting, The Ambassadors, by Hans Holbein the Younger (check out the entry below). 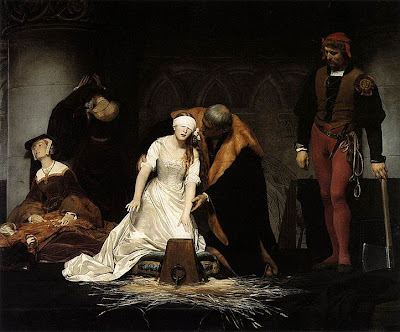 But nothing prepared us for the next painting we stumbled upon: The Execution of Lady Jane Grey by Paul Delaroche (17 July 1797 – 4 November 1856). This painting is my all time favorite. While the scene is incorrect (artistic license), the emotional message is unparalleled in anything I have seen. Here is a girl of 16, who has been politically used, facing her death on the chopping block. Her reign as Queen lasted only nine days and her young life came to an end six months later. The following YouTube article from the National Gallery tells the story far better than I. As the above video demonstrates with close ups of the painting, you can feel the fear in Lady Jane's posture. With no motion, you see her hands tremble and no sound, hear the ladies in waiting, wailing in anquish. Delaroche accomplished one of the most moving paintings I have ever viewed. During the last 11 years, I have visited the painting four times. Every visit finds me mystified, standing in front of this mere paint on canvas, totally enraptured by the story it tells. If you ever get to London, please, please jump in a cab and go straight to the National Gallery--it will be well worth the time. Best of all, it's free!